PRESS RELEASE: With its introduction in 2003, the Sabian Xs20 series offered a totally new type of innovation: quality cymbals in premium B20 bronze at a very accessible mid-price point, making them ideal for the serious student and budget-conscious semi-pro player. 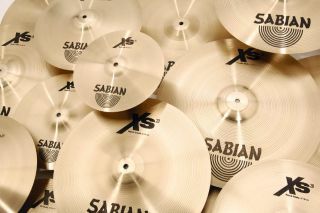 Originally available only in Natural Finish, Xs20 — thanks to what Sabian describes as 'overwhelming demand' - are also now available in Brilliant Finish In addition to giving the cymbals a bright, professional appearance, the highly polished Brilliant Finish contributes to a smoother, glassier cymbal sound. "The demand for Xs20 in Brilliant Finish had become overwhelming," said SABIAN Master Product Specialist Mark Love, "so the complete series is now available in a choice of Natural and Brilliant Finish." "Xs20," he continued, "is crafted from the same special-formula B20 bronze as our professional series, like AA and AAX, and many of the techniques used on those cymbals, like high pressure, a proprietary shaping process and hand lathing is applied here. Xs20 is all about performance without the price," concluded Love. "It's a great value, especially in today's economic climate. You could say it's too good for its price. But while price is a key point of appeal, what makes Xs20 so unique is that combination of price and quality." Line-lathed on top and bottom, and with bright sounds designed to cut through in most music, Xs20 is quality-protected by the SABIAN Two-Year Warranty. This series is available in a complete range of models, including Rock weights for heavier players. A "Sonically Matched" Performance Set (14" Hi-Hats, 16" Crash, 20" Ride) and an Effects Pack (10" Splash, 18" Chinese") are also available in both Natural Finish and Brilliant Finish. Available in Natural and Brilliant Finish. Add "B" to product number above for Brilliant Finish.